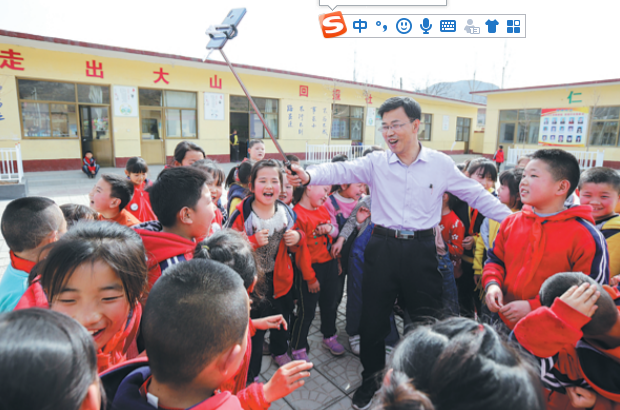 A middle-aged primary school principal in an impoverished village in the mountains of North China has managed to become an online sensation due to his work on behalf of students. "Today we've made two dishes for the students, with milk also served," 46-year-old Chen Wenshui livestreamed from Baoding, Hebei province. The underprivileged village of Dalinghou, located 160 kilometers southwest of Beijing, is connected to the outside world only by a 340-meter tunnel. Chen, principal of the primary school in Linghou, has been taking advantage of the internet to link the school and its students to the outside world. He didn't grasp the potential of livestreaming until September, when he saw his 23-year-old son post videos online. Eager to share the happenings at the school and bring comfort to students' parents who work in far-flung areas, he learned to use Douyin, an online platform for short videos. Since then, he has been broadcasting live or posting videos of students' daily lives regularly on the platform. "I want to show what students are given to eat at school, how they do physical exercises and what changes are being made to improve the school's facilities," Chen said. Hindered by barriers like its remote location and poor transportation infrastructure, the village has seen many residents head off to big cities, leaving behind minors and the elderly. Chen said that roughly 80 percent of the 218 students are cared for by grandparents. "However, that is far from sufficient." To fill the void, the school should do more, especially for financially struggling students, he said. "We must make them feel loved and cared for." Chen, who has taught for 27 years, grew up in a family of educators in the village, with his grandfather, father and uncle all having worked as teachers. "My father said a teacher should take care of students both in terms of their studies and their lives," he said. It has been part of his family tradition to help students in need by buying them clothes or school supplies. But the help he can offer is limited as there are 30 students from extremely poor families studying at his school. In November, Chen and three teachers visited a poor student named Liu Chaonan. The third-grader's father was unable to walk because of illness. The mother is a manual laborer and the family's only breadwinner, and an elder sister had previously dropped out of school due to financial difficulties. Chen shot a video showing the poor condition of the home and the family's plight, and posted it all on Douyin. "After a short time, dozens of viewers contacted me for more information about the family and offered to help," said Chen. Some 4,600 yuan ($686) was donated by 16 viewers, which helped the family out of a dire situation. "Many kind strangers are eager to help poor children, but they worry about their money being properly allocated, " Chen said. To allay such concerns, Chen invited Liu's mother to school the next morning and delivered the donations, with several teachers as witnesses. He also recorded the process and sent the video to donors. Chen has posted more than 400 videos online, attracting 2.18 million likes, and his account on Douyin has more than 120,000 followers. The videos he posted online have helped bring in many donations, either for an individual student or for the school in general. He has chronicled each donation and its usage, and shares them via a WeChat group made up of donors, teachers, education officials and journalists. In one of his videos, Chen is seen frolicking on a grassy lawn like a child at a kindergarten affiliated with the school. "The lawn is 590 square meters and it cost 33,040 yuan to put in place. We have already paid 23,040 yuan to the company," Chen said in the video. Liu Mengyuan, 29, said her 3-year-old daughter was extremely happy with the lawn at the kindergarten. "All the teachers are kind and care about our children," she said. "The facilities are becoming better and better." Chen is now hoping for a basketball court and an auditorium.